This is a yummy little warm dessert that is simple to make. 1. Preheat oven to 350 degrees F. Grease and flour an 8x8-inch square pan. 2. 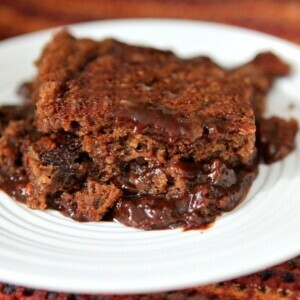 In a medium bowl, mix flour, granulated sugar, 1/4 cup chocolate chips, 2 tablespoons cocoa, baking powder and salt. Add oil and 1/2 cup buttermilk; stir until the thick batter is evenly moistened. Scrape batter into prepared pan and spread level. 3. In the same bowl (no need to wash), mix brown sugar with 1/4 cup cocoa and 1/4 cup chocolate chips. Scatter over batter in pan. Evenly pour remaining 1 cup buttermilk over brown sugar mixture; do not stir. 4. Bake until edges of cake feel firm and spring back when lightly pressed, about 40 minutes. 5. Let cool in pan on a rack at least 15 minutes. Serve hot, warm, or at room temperature in bowls, scooping under cake to pan bottom to include pudding with each portion.